It is always fun to have a creative playdate with friends. Not too long ago I got together with my girlfriends Glenda and Deb. We had no plan…which I always love. We started playing with flowers which led us to talking about ideas for backgrounds. Soon we had the stencils out. Just using a few stencils in our projects brought them from pretty to gorgeous in a very short time. Glenda had painted this piece but was not happy with it….something about it just bugged her….I think we can all relate to the feeling. Of course with all of our recommendations, which is what I love about creating with friends; she made the vase a different shape and floated some color on it. The dots were added with a scruffy brush, but could have easily been done with a stencil. The background was then stenciled and a little shading was added. What a difference the little details made. Deb was working on a black canvas, after painting her flowers she stenciled the word Faith across the top. Still wanting a little more, she stenciled semi-gloss black dots on the matt background. The little extra detail just made it pop. It is a little hard to see the dots in the background, but she did the same technique on the love canvas. 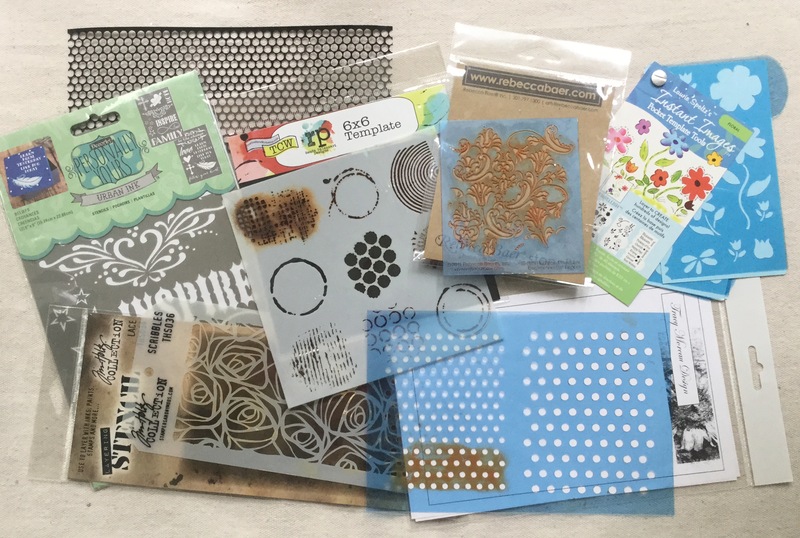 Our playdate made me think about how many times I use stencils on my projects. I like the little details and interest that they add, not to mention it can be done quickly. Here are a few of my designs where I used stencils. At the end of the article I will provide a complete list of sources for the stencils. On my “Sweet Friends” design I use Rebecca Bear stencils for the fabric on the coats. On my snow lady Gretta from my book with Amy Mogish “Jane & Amy Create Christmas” I used a DecoArt stencil for the background and a Tim Holtz stencil for the dress. On my “Art Bin” project I used a Crafters Workshop stencil for the wording and a Stencil Girl stencil in the background. I usually get Crafters workshop stencils at Amazon or Joann Fabrics online. On my “Chickadees and Berries“project, I used a Tracy Moreau stencil for the background and sides of the box. I also used a Hero Arts stamp for the background. My “Birds of Encouragement” uses a Crafters Workshop stencil in the background of the project. This stencil has 9 different design elements on it which allows you to do a lot of interesting things with it. This project “Sitting Pretty” uses Tim Holtz stencils in the background. On My Harvest Angel from the book “Celebrating Fall with Friends” I used two Tracy Moreau stencils and a Tim Holtz stencil. On my “Sweet Treats Santa” from my book with Amy Mogish “Jane & Amy Create Christmas” I used a Tim Holtz stencil for the coat and a Tracy Moreau stencil for the base. I also used Punchinella sequin waste for the hat and base. It is a ribbon that comes in rolls and it is what is left after they make sequins. I use it often, it is inexpensive, you get a large roll, and is great to use for group projects….plus I like how it looks. I usually get it from Amazon. My favorite stencil brushes are from Laurie Speltz, she also has a large selection of wonderful stencils. I used one of her stencils on the houses in my Spring Houses post. Play, add and experiment with stencils in your art. Both things will bless you and stretch you in your art. Thank You Holly, I enjoy painting birds and they are always my most popular designs. Can you tell me how the pretty roses were made- the ones on the canvas?